I still haven’t bought my stuff for the grinding of the mirrors but I do have the mirror blanks at home. If you don’t know about making scopes, 2 will be required. In ” Amateur Telescope Making”, they recommend using an oil drum to mount the tool on. I don’t have an oil drum, so an alternative is to fill a tub with cement (not a bathtub) and put a wood post in it that is perfectly straight. Once it has dried, you can mount another piece of wood on top of that legnthwise and there is a great sturdy “grinding stand”. 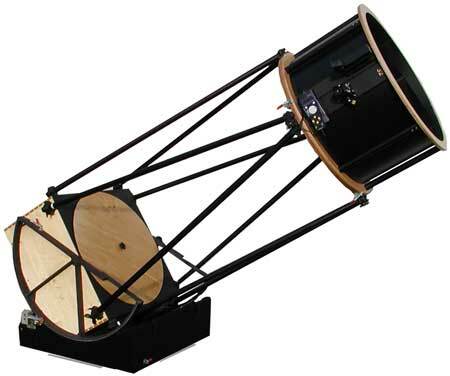 One of my observing heroes is Sir William Herschel, who of course, made the great 48 inch Newtonian Reflecting telescope. At the time of completion, it was the largest telescope ever built, having a focal length of 40 feet! But in the time of Herschel, there was no focault or Ronchi test and therefore, he had to star test the figure. So he had to mount it somehow, and look at a star with the polished surface only and see the appearance of the diffraction spikes, if any at all. 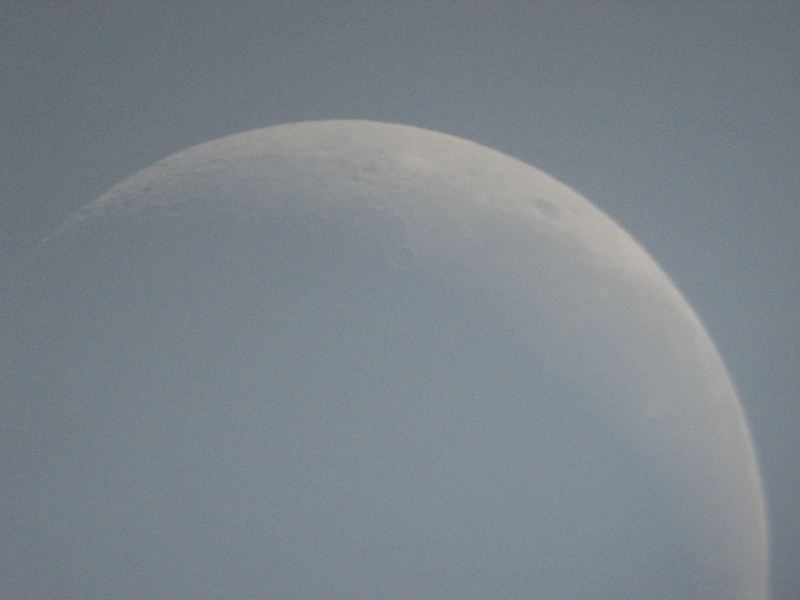 On 7-8-12, I was out with my 70mm refractor. I was viewing the area around Sagittarius and Scorpio, my constellation. 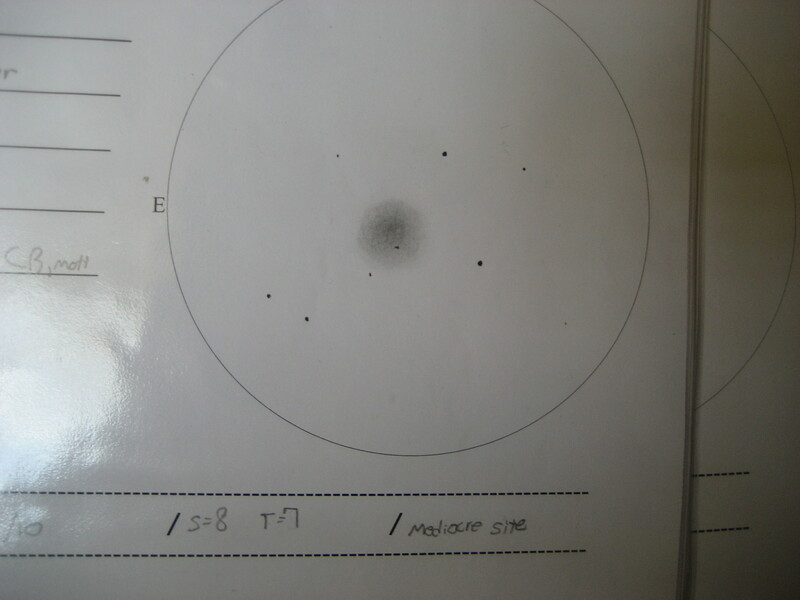 First I looked at M7, that open cluster I talked about in an earlier post. I was using those charts that I posted a link about, astro-tom. Like I stated before, they are an excellent set of charts and do nicely for a Messier viewing night. Speaking of which, I almost halfway through my Messier program through the Astronomical League. Last night, I added 28 and 29. 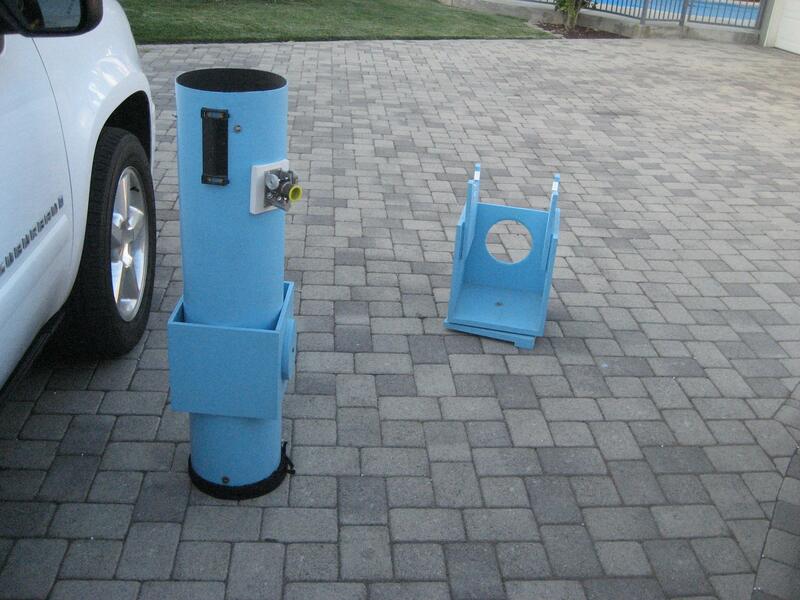 I am not sure if I mentioned this before, but I am part of the Pomona Valley Amateur Astronomers, see the website. http://pvaa.us/ Please check it out if you live in the Pomona area as it is a really great club to be in. If anyone is interested at seeing my sketches or asking questions, I will be at the meeting on this Friday (see club calender). 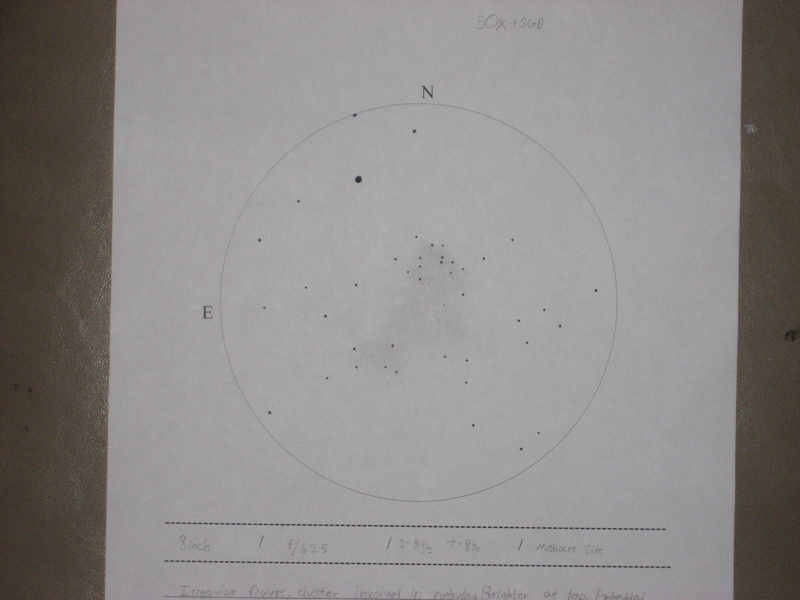 By the way, I tried out my Uranometria 2000.0 and it has an unbelievable amount of accuracy. Most of the objects that are in that book are really dim objects, so it doesn’t do much for my 70mm. 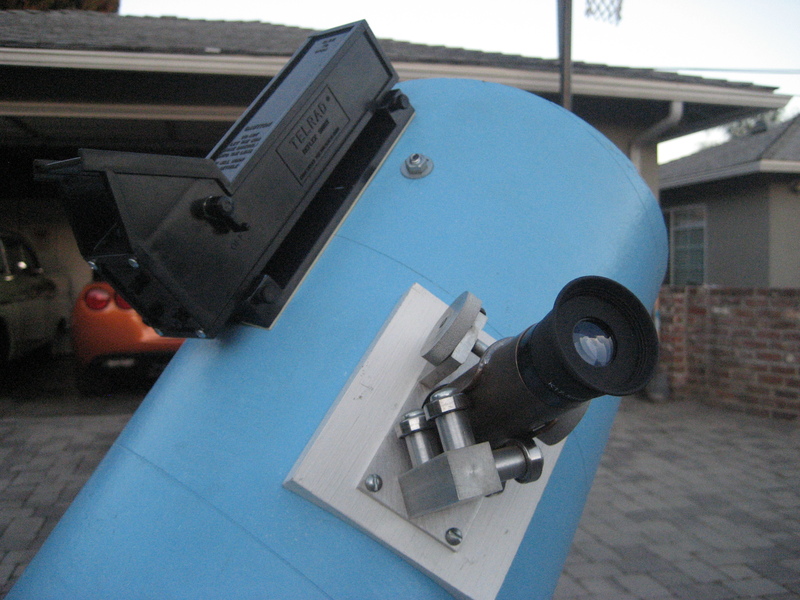 Hopefully, when I get my telescope making project finished, that will open up some more deep sky objects to view. There is an excellent chart that the author made up to ( at the bottom of the page). I actually viewed the nova last night, see my comment on the right side bar of 10minuteastronomy. Observing with a big aperture scope is definitely worth it. My dad recently purchased the Orion 14″ go to model. I’m sure everybody who’s got a scope around that size has probabily looked at on telescope.com. 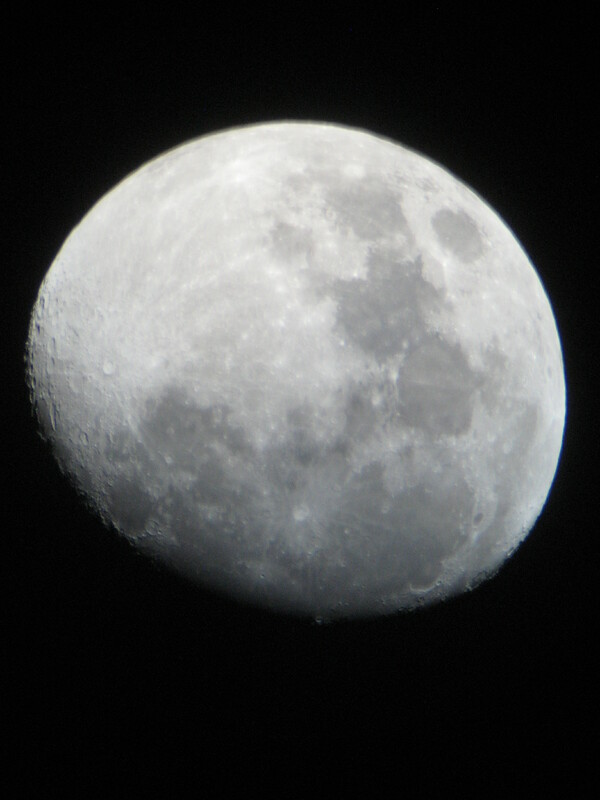 Last night was nearly full moon, I think it was 98% or something close. 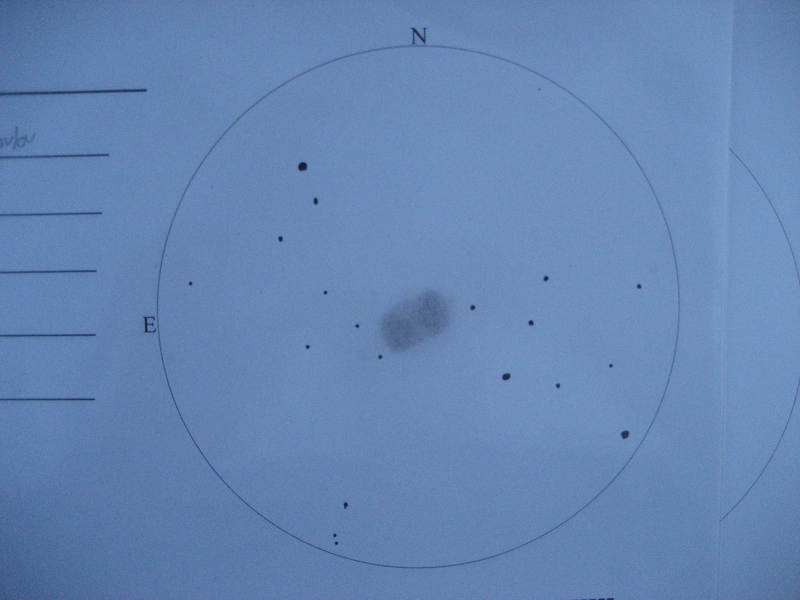 It was not a very good night for lugging out the big scope but he had just got it laser collimated with his new device. It worked good enough, the images were crisp all the way down to 8mm. We first looked at Saturn. I counted 6 moons and 3 divisions in the rings. A great view for such a crummy night. 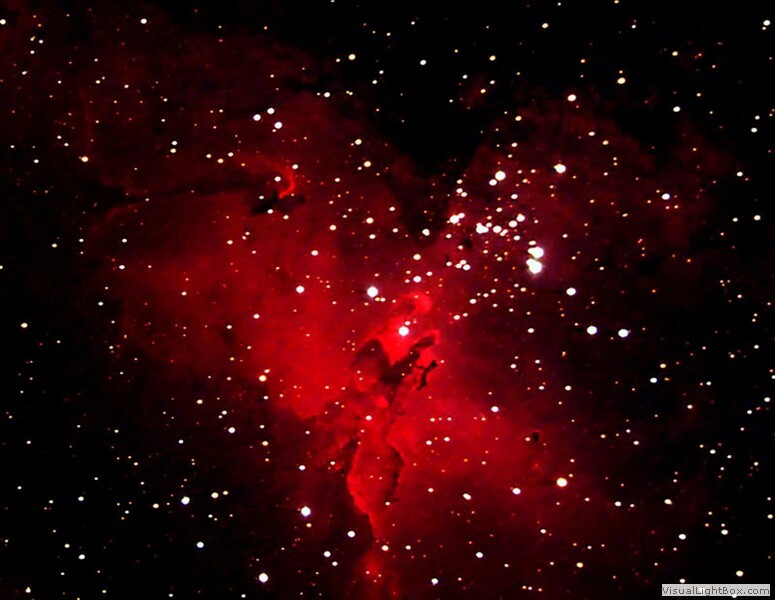 Then we looked at some open cluster in Cygnus. It normally is a star filled area but I only counted 7 stars in the cluster. Then finally, we pointed the big gun toward the moon, which was over the basketball hoop at that point. I got the first look with about 175x. It was blindingly bright as it should be. When you leave the eyepiece, you get that imprint on your retina. I can remember closing my eyes and still seeing Kepler and Copernicus. He filtered it down some, but it still hurt a lot. It wasn’t a very good night but it was certainly memorable for some reason. By the way, my book Uranometria came just after I finished my post. It truly is the “deepest” map I have ever seen. The only drawback is that Sagittarius and Scorpio get cut off, they are considered a southern object. But in late July to August, they work their way up in the sky pretty high. Oh well, I guess that means that I’m buying the southern edition. Anyway, if you really want an advanced set of charts, buy Uranometria 2000.0. Highly recommended to the experienced amateur. Even though I have this detailed chart, I am still going to buy the “Bright Star Atlas” by Wil Tirion. It is a nice little chart that shows bright stars and bright deep space objects. For one of those nights when you don’t want to scan the skies for faint fuzzies. Hi and thanks again for visiting my blog. I will be talking more about deep sky observing. I am still waiting for my star chart book and hopefully that comes very soon. I would talk about making astronomical sketches but unfortunatley, I don’t have the camera adapter and you would need a visual reference. I started really “seeing the night sky when I started taking good astronomical notes. My first sketchbook was very crude and doesn’t really describe the object being viewed. I have recently taken up the aid of the computer to help me with my notes. I have made an excellent sketching/recording template using open office. If anybody would like to use this format I am more than happy to share the document with you. If you want it, just post it in the comments section of this post. Some of the best summer deep space objects are high in the sky right now. 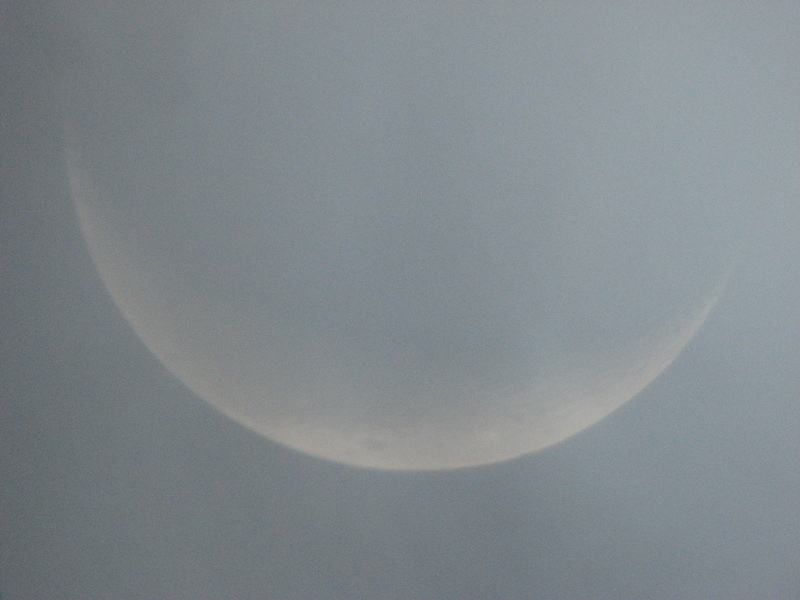 Of course, that large moon is hindering the view, so you’ll have to wait until it goes down. Among those are the great Hercules Cluster (M13) in Hercules. Another couple of good globulars are the M10 and M12 clusters. These reside in the constellation of Ophiuchus ( I think that’s spelled right). I had a remarkable evening on the 19th of June. I live in the extremely light polluted city of La Verne, so the seeings never very good. This night was extraordinary however. For one of the first times in La Verne, I could finally see the milky way. I’m sure that if you live in Arizona or Utah or some place in the middle of nowhere, you have been spoiled by your pitch black skies. Next time you get the chance, drive in to the nearest good sized city and you will be astonished how bad the skies have become. Then you will come to appreciate your regular observing site a lot more. I only experience dark skies a few times a year. And I make the most of those remarkable evenings. I use my grandpa’s 16″ f/4.5 at his house in Arizona. There is nothing like putting in a low power eyepiece and scanning the milky way. Anyway, I am currently working on the Astronomical League’s Messier program and am almost halfway there. On that great night, I logged in 6 objects and made 2 sketches. I could have made more entries, but there were so many visible at the time, it would have taken a good hour to log them all in. 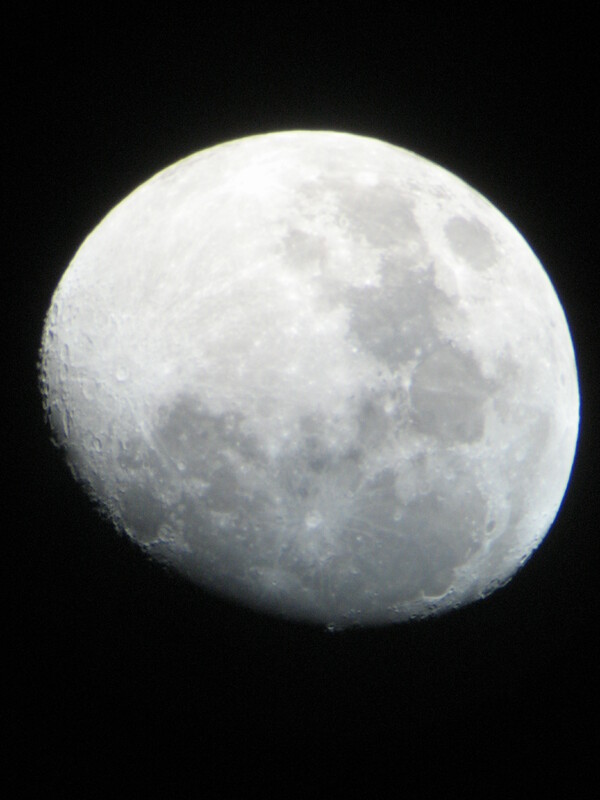 But anyway, like I said, check out astro tom’s site as well as 10minute astronomy. Good luck and happy Observing.